Clarksville, TN – Austin Peay State University (APSU) men’s tennis team started off strong en route to its first win of the season, defeating Cumberland University, 6-1, Tuesday, at the Governors Tennis Center. The Governors (1-4) used a brilliant doubles performance to instill some confidence after losing the doubles point in the previous four matches. Almantas Ozelis and Anton Damberg got things rolling for the Govs, winning 6-2 at No. 1 doubles. Not long after, Timo Kiesslich and Jacob Lorino gave the Govs a 1-0 lead with a 6-2 victory of their own. Chad Woodham and Hunter Sanders also prevailed at No. 3 doubles with a 6-4 win after being down early. The Phoenix (0-1) came out fresh for singles, taking the first set at No. 1 and No. 4 singles. However, Anton Damberg had his best performance in a Gov uniform, as he swept aside his opponent at No. 3 singles in straight sets, 6-0, 6-4, to give the Govs a 2-0 lead. 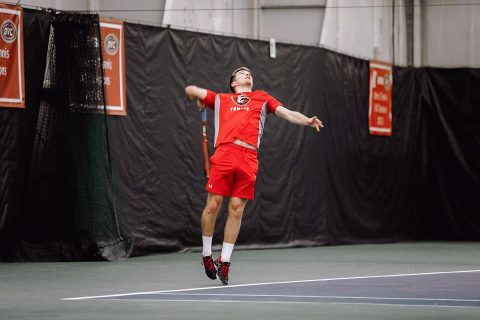 Damberg’s victory was the turning point in the match for the Govs, as the Phoenix were controlling the early portions of the singles matches. Ozelis, who lost the first set in a tiebreak, rebounded to take the second set, 6-2. Lorino also answered back at No. 4 singles after dropping the first set, while Kiesslich also headed to a third and decisive set after splitting the first two sets. Ozelis seized control early on in the third set, with his advantage made stronger by a game penalty on Cumberland. Ozelis fought off any comeback from his opponent to claim a three-set win and put the Govs one point away from victory. With No. 5 and No. 6 singles getting underway, Lorino got an early break in the third and held on with many clutch points to claim the third set, 6-3, and the match for the Govs. Woodham also claimed a straight-set win and Sanders won at No. 6 singles after a solitary eight-game set. The Govs stay at home for their next two matches, first taking on IUPUI, 2 p.m. Friday.